Early in the morning hours of October 1, 1910, a bomb exploded under the Los Angeles Times building unhinging the south wall and causing the second story to collapse. Twenty one employees were killed and another one hundred were seriously injured. The long bitter fight between organized labor and Otis Chandler, owner and publisher of the Times, placed suspicion for the crime on union malcontents. Chandler hired a detective to find out who was responsible for the bombing. The detective found evidence that fingered two union members referred to in the press as the “McNamara Brothers”. They were apprehended and charged with the crime. Both pleaded not guilty. The American Federation of Labor hired Clarence Darrow to assist a local attorney in defending the accused; however, when the two pleaded guilty to avoid the death penalty, the union leaders knew that further effort on their part to unionize local workers would be futile. Otis Chandler had won the battle and continued to challenge unions and other organizations that had far left and socialist leanings. The local attorney hired by the Federation was Job Harriman, a member of a number of socialist organizations, who had aspirations in local politics. Some voiced the opinion that Harriman was run out of town by Chandler along with Harriman’s union buddies and others associated with defending the accused bombers. Harriman was a man of means and the strength of will to try something new, something to challenge his intellect – like starting a socialist utopia in the desert. He discussed his plan with a number of likeminded friends, also of means, who warmed to his ideas and were willing to lend their support and some capital to the venture. 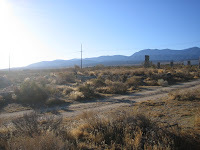 In the 1890s, a number of colonies dotted the north sloping terrain that extends out from the base of the Angeles National Forest to the Mojave Desert. One, named Rio del Llano (river of the plain), brought water from Little Rock Creek to crop land which the company marketed to eastern farm families. A number of families bought into the colony and planted fruit trees and field corps. Unfortunately, successive and exceptionally dry years in the late 1890s put an end to the development forcing the company to declare bankruptcy and the farm families to move. Harriman and his associates acquired the irrigation bonds for the defunct colony which included 9,000 acres. They incorporated a new company in 1913 and began selling stock. Soon, promotions for the new colony appeared in socialist publications throughout the country. Members started arriving in the spring of 1914 and within six months membership reached 150. Harriman believed that social justice would prevail if those who have would willingly share with those who have not. The colony would operate on the principle of social democracy – members would have voice in all matters. Vineyards and fruit trees were again planted along with field crops and fresh produce for local consumption. 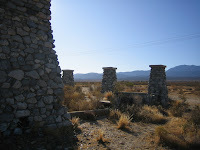 The name of the colony was changed to Llano del Rio of California. New members were required to buy 2,000 shares of stock at one dollar per share. Each settler received four dollars a day in credit toward the purchase of food, clothing and other needs within the colony. Ownership of assets including land, structures, livestock and crops were held in common. Members were allowed title to their personal belongings including a motorcar. Members brought a range of skills to the colony. Family values were important and education for children received priority. Some were devout socialists. Others joined for less lofty reasons. Those with religious leanings were tolerated and all ethnic groups were welcome, however, I noted that only white faces appear in resident group photographs. The baseball team won most of its games and the players looked sharp in bright red uniforms. The brass band, judged to be the best band in the desert, played at parades, other special events and wherever else invited. By 1917, two-thousand acres of the desert had been scraped aside and some 400 acres turned to fruit trees and alfalfa. The crops were served by miles of ditches fanning out from the main irrigation cannel and tunnel that intercepted and delivered water from Big Rock Creek. Major livestock buildings included: a large dairy barn and silo located one-half mile south of the main settlement; a world class rabbitry providing the colonists with their main source of meat; and a large stable complex, located north of the settlement, that could house up to 100 horses. The resident population topped 1,000 by early 1917. 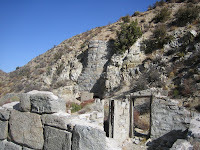 A visitor would notice that adobe and rock-faced houses had replaced the scatter of tents that he had seen here two years before. He would be impressed with the variety of industries that had been established in such a short time -- two machine shops, a cannery, a planing mill, a paint shop, a brickyard, a flour mill and a fish hatchery, two newspapers and a print shop. Up the road, in addition to the dairy, he would find a saw mill and at the foot of the mountains two lime kilns for making cement. He would also take note of the variety of personal services one would expect to find in a community of comparable size. Not all was bright and friendly. Complaints filled the agenda of weekly assembly meetings. Laggards - those who refused to do their share of the hard work - ranked high on the list of complaints. The food shelves at the commissary lacked variety and the ever present, colony- grown carrot became its symbol. In lean times, cooked carrots could be expected at all three meals. And to many, those responsible for overseeing the completion of community project represented the hated bosses of their past. Of course, without someone in charge nothing would get done. Most meetings lasted for hours with resolutions discussed, passed and soon forgotten. Those for whom the “socialist calling” no longer held sway were encouraged to leave to be replaced by the new arrivals. Nationally recognized socialist writers and thinkers complained that Llano was too “middle class” and wedded to the way of capitalism. 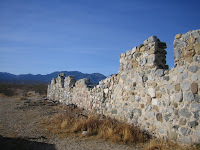 Harriman answered their cries stating that ventures such as Llano del Rio were the first step toward a peaceful demise of capitalism. Things were soon to change dramatically. The colony planners had not realized that Big Rock Creek had a serious leak. In good years it didn’t matter. But in dry years much of the limited runoff was fiendishly seeping into the deep gravel bed created by the San Andres rift that crosses the creek. They had planned to build a dam on the up side and form a basin for storing water but later found that construction costs would be prohibitive. The problem was kept from members while Harriman searched for a new location for his colony. Moving day was celebrated in October 1917, and publicized as a “new adventure”. Virtues of the Louisiana site were extolled - sounding much like the virtues voiced for Llano of California in the early days. The faithful packed their belongings and drove or took the train to the new destination—an abandoned lumber town near Leesville, Louisiana. It was estimated that less than half of membership made the trip. A few stayed to tend the orchards, gardens and the saw mill which continued to cut and ship lumber to Louisiana. Due to poor health and mounting financial problems, Job Harriman left the new colony and later commented that most of the members had been selfish, arrogant, egotistical and lazy, and more so among the poor than among the rich. Job Harriman died in California in 1925. With a much smaller membership base, New Llano Louisiana struggled to survive into the 1930s. 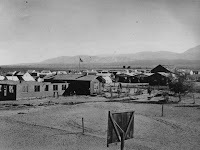 The 1917 photograph was taken looki ng south across the settlement. My photo on the right was taken from the same spot as the 1917 photo also looking south. I visited the ruins a few months ago and took the colored photos included in this posting. 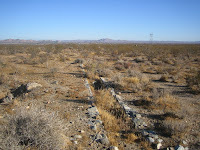 Next on the left side is a photo of the rock lined irrigation ditch located along the east side of the settlement, on the right side a photo of the wall of the horse stable located north of the settlement. Next on the left, the cow barn wall and silo located one-half mile south of the settlement. On the right, a photo of the lime kiln located at Bob’s Gap on Bob’s Gap Road (GPS 34 27.127 N; 117 48.757 E). 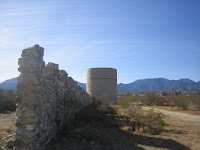 The kilns provided concrete used in constructing building walls and lining the irrigation ditches.